1. Use WD40 liberally. Spray it on metal and plastic and then rub like mad until the nasty gunk comes off. You need to be patient and use a brake cleaner after using it on brake calipers as this will get rid of any oil residue. 2. Pay special attention to the wheels. The difference between a bike with dull and shiny wheels is amazing, even at first glance. I use WD40 and then shine afterwards with furniture polish. 3. Also make sure the screen is spotless. A product called CrystalGlo (£5.99 for 235ml, 01933-418414) will fill in scratches and leave it spotless. The screen is one of the first things people see and a clean one has a psychological effect on the buyer. 4. Get into the nooks and crannies with a toothbrush. Potential buyers will look at things like the footpegs and the forks under the nose fairing. Get rid of any crap and rust in these areas. Use WD40 or Autosol, or both. 5. Get rid of horrible stickers, including tank pads. People think stickers hide scratches and they’re usually right. It’s better to be honest and admit there are scratches. Peel them off and then spray on furniture polish. Leave it for a few hours and wipe off with a cloth. Any residue will wipe off with polish and a cloth. 6. Clean the brakes. Shine the centres with furniture polish and then rub the outers with a Scotchbrite pad (£1.09 for three from grocery stores) to bring back the shine. 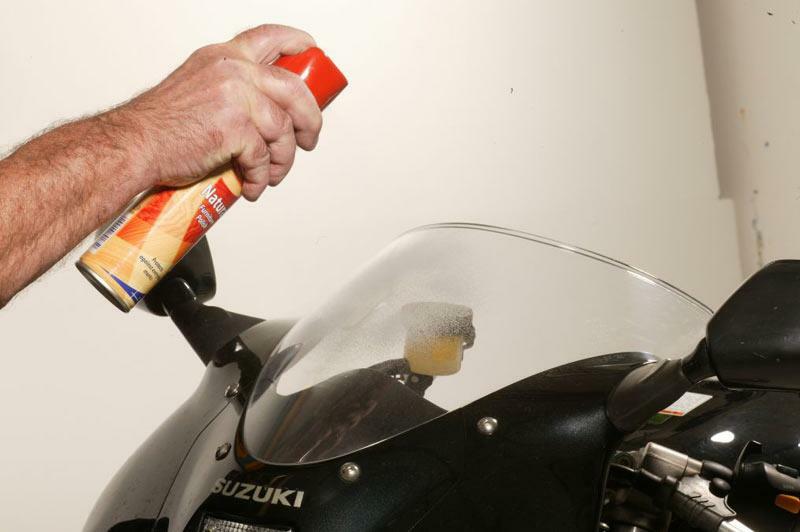 Use a brake cleaner afterwards to remove any residue. 7. Clean the engine thoroughly with WD40 and Autosol, including underneath it. These are the details that people really notice when they’re looking at a bike. Take off the details that are personal to you, like digital clocks. They mean nothing to a buyer and might put them off.